The Galaxy S9 is bound to receive Android 9.0 Pie very soon, and software builds for the device have already appeared online, allowing adventurous developers to sideload the build and test it out on their own devices. We've already been treated to a full preview of the upcoming software goodie, but more and more tidbits of info pertaining to the upcoming build pop up all the time, with the latest one being a closer look at the newly-fangled Night Theme, a brand new feature introduced in one of the latest Android Pie betas. Before we detail Night Mode, a little pre-history is in tow. For years, Samsung has defaulted to a clean white interface of most of its stock apps, as well as core interface elements like the notifications shade/quick toggles pane and the main settings menu; hordes of vocal users have continuously expressed their desire for a native dark theme to make an appearance and make better use of those first-class AMOLED displays on deck. 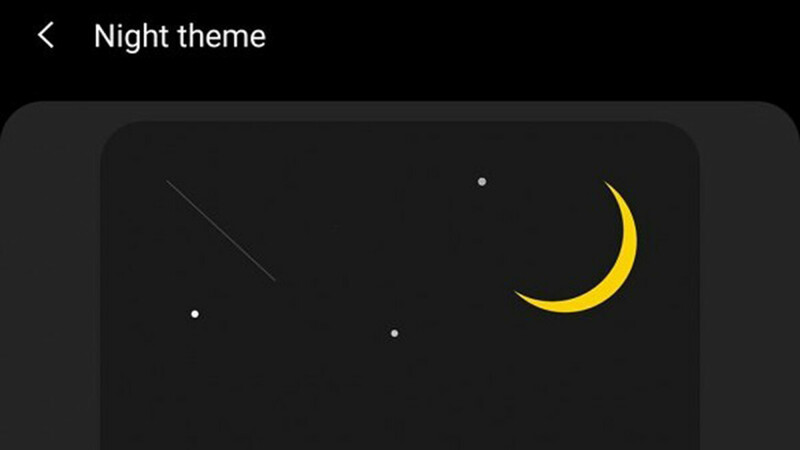 While such a thing could be achieved with the help of custom themes, a native dark theme remained a chimera for Samsung users. Well, no longer, as Android Pie will seemingly bring a nifty Night Mode toggle in the settings app, which would allow users to switch between the regular bright and the new dark theme with a single tap, without having to resort to finding the perfect interface theme from the theme repository. The theme seems to be affecting almost all stock Samsung apps and interface elements, including but not limited to the main Settings hub, the notification shade, and others. We should probably expect Samsung to release Android Pie for the Galaxy S9, S9+, and Note 9 soon, probably in a month or two. Traditionally, Samsung users usually had to wait well until late December or even late January in some extreme cases, but hopefully Project Treble will speed things a bit. Good but whole interface looks too wierd almost everything thing is in rounded conor boxes! Elvis, I agree. The rounded corners ers just look weird. I do applaud the dark theme as it is ALWAYS my preferred look. Try iOS smart invert. Looks really good. They would give dark mode in next iOS version according to me, as next iOS is about design and let then take time to implement it better and not like windows 10 did (we have a dark mode it looks s**tty and with no design changes to better fit the dark theme but we have a dark mode). Samsung has been releasing beta versions of the latest Android in late October for the last couple years. Are they doing this again with the S9/S9+ ? Don't worry, Google will copy this about 2 years later. Nice. I downloaded a dark theme on my S9, but I'd prefer a native dark theme. For all its issues with apps, nobody does dark theme like Windows Mobile. +1 comment of the day Man.Love it when you mention WM dark theme with all its apps.Its closest may be only one+ and sony Ui dark theme.soon windows 10 may adopt dark theme too rather than dark mode. Is this exclusive to samsung? I really hope that on Android Pie will improved the battery life and camera on Samsung Galaxy S9s. I already use this "theme" with the help of a couple of extra apps and settings so having it built in is welcome and overdue by a few years. It's not as dark as the Mate 10 Pro or P20 Pro dark theme.